Coming to Bangkok. Expensive. Book a hotel for several days and people. Expensive. Organize this all trip and try to find activities that will be fun. Expensive. Seeing his face during and after the awful day (for him). Priceless. Nothing else, but if you have any ideas to make the Groom suffer even more, ask us and we will make it happen! In the case of the Smash The Groom Package, if you want to have more girls with you, contact us with the details and we will make it happen! For this day of intensive Groom smashing, he will need the Minivan to cool down between stops. It will also help all of you to get from one place to another in a comfortable manner, until 3AM! 3PM: Let The Hunt Begin! We start hard for the Groom, very hard. He will have to wear a Rabbit Costume (with protection underneath) and he will have to run for his life, because the rest of you will be hunting him! Try not to aim the head, and good hunt! 6PM: Let The Pain Flow! If your Groom thought that his day of suffering had come to an end, he is very much mistaken. After a little break when he can count how much bruises he has, the day continues with a fetishist show at your hotel! The two girls performing the show will have one target and one target only: the Groom. Prepare to be whipped and waxed! 7PM: They Are Already Here, Waiting For You! Let’s give a little break and some joy to our suffering Groom. And what is better than a good striptease? Not much, especially when she will only give him lap dances. Sorry guys, but remember: this is the only good moment that will happen to him! 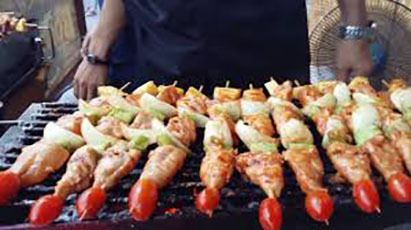 The barbecue is composed of chicken and veggies brochettes, and it is as much as you can eat! You do not have to exit the pool to get it, the girls are also here for that! They will be the real attraction of the party, and are only here for you! For the next 4 hours, they will take care of you, give lap dances, have fun with you, but more important than everything else, they will make sure you are having a good time! The Groom just had his fun, but this is Smash the Groom, and good things have to come to an end for him. He will be blindfolded and the Stripper and a Lady Boy will switch places. How long will he take him to figure it out? 8PM: Let The Suffering Be Public! You now enter the best street for Go Go Bars, Soi Cowboy. The Groom might thing that this is it for him but no. Now we attack the second part of the package: less physical pain, more humiliation! Will He Finish The List? For the second time of the day, he will be wearing a costume, and you guys will choose which one. The second thing will be the Dare List. Ask us for it, and do as many modifications you want. The Groom will have to do them! The costume and the Dare List is not good enough, we need to add ever more. In this case, it will come in the form of a costumed Little Person, and they will be handcuffed together. Wherever the Little Person goes, the Groom has to follow. Don’t worry, our Little Persons are experts in being pains in the arse! Even though the Groom will not have a lot of time to enjoy her company, you will! She will guide from bar to bar, and help you realize the Dare List. She will try to ease the suffering of the Groom, but will probably fail. Tip: the Little Person usually does not speak English, so you need her to communicate with him.